Click to enlargePowdered milk paint can be purchased and just mixed with water. This would be convientent but would cost about $36.00 a gallon. But making your own milk paint is relatively easy and would be half the cost of buying the ready mixed. 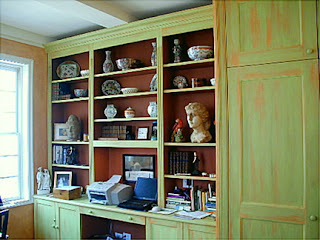 The lime powder and the pigment is available at paint stores or even some craft stores. The results are amazing, flat muted color that resembles old world plaster. Many artists still use this ancient paint because of it’s work ability and the tone of color. Click to enlarge This recipe uses fresh milk that is curled by using the vinegar. By using the curdling method you have a stronger paint that is resistant to mold. To begin: allow the milk to come to room temperature, but no warmer than 115 degrees. Pour the milk into a large container and add the 2 cups vinegar which starts the curdling process. Allow the mixture to sit overnight in a warm place stirring every once in awhile. The next day you’ll be able to notice the milk solids separating from the liquid whey. Have everything ready prior to mixing in the pigment as milk paint should be used when it’s fresh. Click to enlarge Put the pigment powder in a plastic container and add an equal amount of water and allow the powder to soak. Begin to stir until you have worked the ingredients into a paste, set aside. Put the lime into a small container and add the 1-1/2 cups of water and stir until you have a smooth paste. Please wear a dust mask to do this step as you don’t want to inhale the lime dust. Next you must pour the bucket of curds and whey thru a colander to separate. Wash the curd with water and allow to remain wet. Remove the curd or Quark from the colander and put into your paint bucket breaking up any larger pieces. Add the lime paste and stir well, then add the pigment. Again, stir well to dissolve any quark pieces. Strain the paint thru a piece of cheesecloth and your paint is ready to use. Stir the paint freguently as it tends to separate. If you have any extra paint and want to keep it, store in the refrigerator, it will keep for several days, although milk paint is best when used fresh. Since milk paint is a thin mixture, you may want to use more than one coat. After the paint is dry you can rub over it with fine steel wool or wax to give it a smooth, sealed finish. Since milk paint is made up of natural ingredients it is a safe product to use throughout your home. It can be used for walls and furniture and is a wonderful alternative to using petroleum based paint that contains caustic ingredients. Many natural pigments come from mined minerals so buying them makes life easier. They’re just a Google search away. You can make your own: Char, for example, makes a good black pigment. You can use almond shells, peach pits, bones, wood, etc.